Russian girls only smile when sees or meet a familiar person or when she is flirting, or when she is really happy or having fun. You must know that the Russians girls do not smile by courtesy to unknown men, and you must not take this as a bad reaction or that she is angry, is just a social custom. Some Russians Brides may seem too much reserved, carefulness or cold with strange man (foreign men and also Russian men). However when they know better the other person, they turn into open and friendly girls. If you have Russian Girlfriends, is very important to congratulate them on important celebrations with small gifts like flowers or chocolates. Making gifts is a very strong tradition which Russian people attach an enormous significance, not only for romance relationships, it is important between the family, with coworkers and also friends. As they like to receive gifts, they also like to give gifts, so you must be prepared to receive them to not hurt feelings. 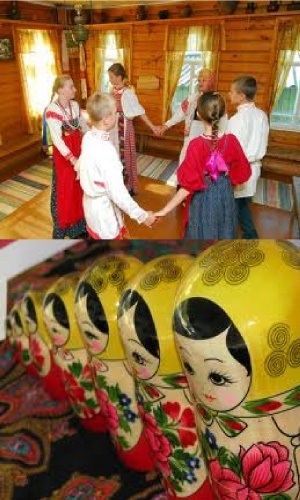 If you're invited to the house of a Russian Girl, it is usual as gesture of "good education" hold a gift. The most frequent gift for the first visit is a bouquet of flowers for the girl owner of the house. For the other visits you can hold cake, a box of chocolates or other sweet things. It is also a good idea a bottle of good wine or liquor, or a nice box of some special tea. It is important to know that the drinks or sweets will be consumed with you. Another interesting tradition is about entering to a house or to an apartment. Russian people removed shoes and wear slippers. Do not be surprised to go into a house and being asked to remove your shoes and put on a pair of slippers, given by the owners. They make this, to not get dirty the floor of their house with the dirt of the streets. Always the guest is invited to eat, or at least share a tea or coffee (always accompanied by sweets, cakes, pies, pastries and chocolates). This could be sound estrange for you, but tea is the most popular drink of Russian and they use to drink it many times a day, at home, at work, etc. The traditions of giving flowers is very strong, and for example, appearing to a romantic date with a woman without flowers could be understood by her as a lack of interest or even an insult. So please dont forget about this in your next date with a Russian Girl. You can buy the flowers in many places, for example near the metro station.It is important to know, that you must always give an odd number of flowers (e.g. 1, 3, 5, etc.) because it is believed that the even numbers are only for a funeral. A Russian girl could understand this in the first dating, but now that you know it is better to avoid a bad impression more if the girl is a bit superstitious.